Cost: No charge if you register one week in advance. Late registration is $25. Bring your Smart Phone or tablet. 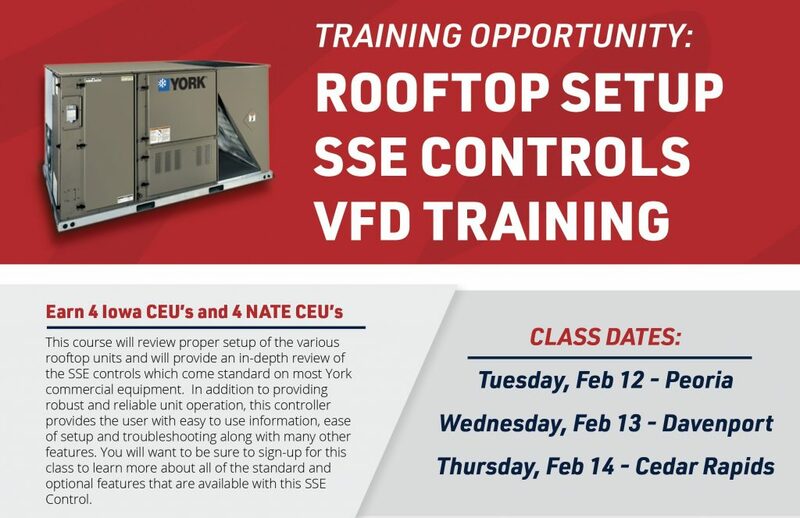 This course will review proper setup of the various rooftop units and will provide an in-depth review of the VFD & SSE controls which come standard on most York commercial equipment. In addition to providing robust and reliable unit operation, this controller provides the user with easy to use information, ease of setup and troubleshooting along with many other features. You will want to be sure to sign-up for this class to learn more about all of the standard and optional features that are available with this SSE Control.